Wellingborough Cycles offers a large amount of cycling products and accessories alongside a great customer experience. Between all shop staff, there are many years of riding and racing experience, helping them to understand the needs of all ranges of cyclists. Wellingborough Cycles pride themselves on stocking the most hotly anticipated and sought after brands from clothing through to all levels of bikes. Stocking products from Whyte, Scott and Cannondale to name a few. With cycle to work schemes and Ride it away finance available, there are many ways for customers to buy the bike of their dreams from Wellingborough Cycles. In 2015 the shop was completely transformed to accommodate even more bikes, clothing and accessories, plus a brand new bike fitting room being run by VeloElite from inside the shop. With various levels of servicing and Cytech qualified mechanics, Wellingborough Cycles are committed to giving your bike exactly what it needs. On top of cycle sales and servicing, the shop also organises rides for every level of cyclists each week. The shop opened in Longtown, Carlisle back in October 2009 with an impressive bike show room and Park Tool equipped workshop. Since then BIKESEVEN has grown their reputation for expertise in cycle servicing, and now have a superb range of bikes and top brand accessories to choose from, including Orbea, Saracen, Ridley, Kona, Marin, Felt, Raleigh and Endura plus a range of e-bikes made even more affordable through Ride it away retail finance and a variety of cycle to work schemes. 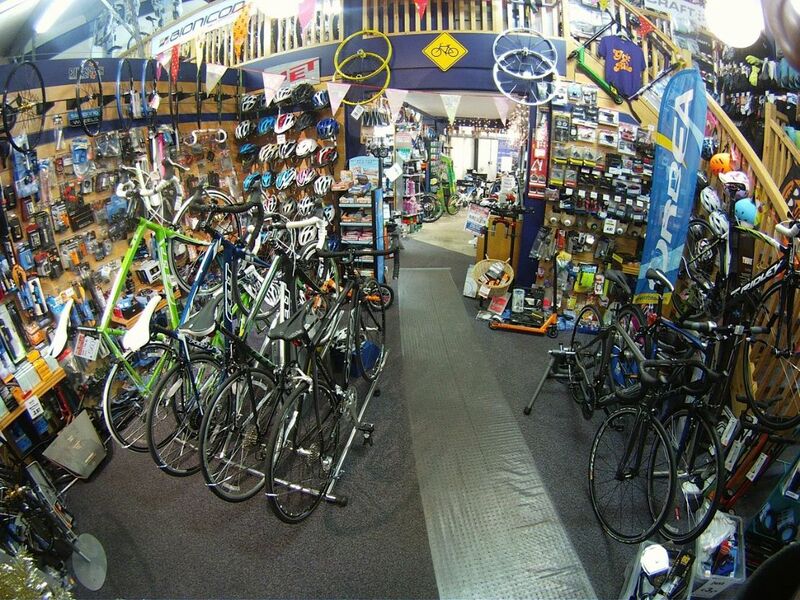 Established in 1981, Bridgtown Cycles is proud to be the Midlands' largest independent bike store. Based in the Heart of the Country, Bridgtown Cycles has become synonymous with extremely high levels of customer service and advice. The shop specialises in long distance cycling with multiple record holders across both road and triathlon as their customer base. Their service to the Triathlon, Sportive, Time Trial and Road Racing communities is unparalleled with glowing recommendations from customers as far afield as Aberdeen, Cornwall and London. The shop stocks bikes ranging from children's balance bikes to high end carbon race machines, made easily accessible to customers through initiatives including Cycle to Work schemes and Ride it away retail finance. The shop is made up of 2 floors, including showrooms and a professional workshop manned by Cytech qualified technicians, plus Bike-fit studios where a coaching service is also available along with a Physio Room. Cycle Route Downend has been the local bike store in Downend since opening their doors in December 2013. Cycle Route Downend pride themselves on being a local independent bicycle store that aims to cater for all, run by local bike riding enthusiasts who know the area and know their product. They are confident that staff involvement will always manifest itself in the form of friendly and informed professional advice whenever you visit our shop or give us a call. Cycle Route have over 25 years experience of the bicycle industry in the UK and worldwide. Quality service & local knowledge are the main goals. With all staff living locally and riding daily, customers will benefit from our knowledgeable staff offering their expert advice, while our fully equipped workshop and qualified mechanics will service and maintain bikes giving help & advice with ongoing maintenance. The spacious new store stocks the best bikes and products from the world's leading brands including Whyte, Focus, Roux, Willier, Ridgeback, GT, GoCycle, Charge, Bickerton, Montague, Pashley and Land Rover. It doesn't matter whether your requirement is a hub geared, belt driven low maintenance commuting bike like the Roux G8, a £2500 full carbon ICU approved road bike like the Focus Izalco Team SL 4.0, a full suspension mountain bike like the Whyte T129S, an electrically assisted bike such as the GOCycle, a child's first bike, a folding bike, a touring bike or a no frills £250 do it all bike - we have product in stock that will fit the bill. Cycle Route Downend offer Ride it away retail finance and are a Cycle Scheme accredited partner, so pop into the shop to find the right scheme for you. McConvey Cycles is a family owned shop which has been in the cycle trade for almost 25 years. The shop is located in Belfast and boasts 6000 sq. foot, carrying a full range of top bicycle brands including S Works, Specialized, Giant and Brompton. All styles of bikes are catered for with mountain bikes, racers, full suspension, hybrids, folders and kids. As a specialist retailer we cater for all cyclists from leisure to enthusiasts and our clothing and accessory range is always updated with the latest popular trends for the coming season. The staff offer a great mix of all aspects of cycling. Roadies, tri athletes, cross country and downhill mountain bikers and also commuters, so you can always rely on the best advice to choose the right product for you. When you've find the bike of your dreams, McConvey Cycles can help you buy it with the Cycle to Work scheme and Ride it away retail finance. McConvey Cycles not only run a bike shop, but also believe in putting something back into the sport, which is why they sponsor and help up and coming riders. In 2015 McConvey Cycles is proud to be the leading sponsor of the XMTB mountain bike team. Les's Cycle's is a family run shop established in 1976 in Canvey Island, Essex. Specializing in high quality cycles for all the family, kids, novice to expert and professional riders, they offer the best bikes on the market, and are service agents for most top makes. All bikes are fully built and serviced in house, with the added bonus of two free services with every bike sold. Les's Cycle's pride themselves on specializing in top quality bikes, wheel building and truing, hydraulic disc brakes shock repair and servicing and frame repairs. Their range of bikes and accessories are available on finance via the Ride it away scheme and through cycle to work schemes. Les's Cycles have a loyal customer base thanks to their friendly and experienced staff, as well as their dedication to giving customers extra. Local cycling club members benefit from a 10% discount in store. This month we honour LeisureWheels in Hemel Hempstead as the ACT Shop of the Month, following their 30th anniversary celebrations in May. It was May 1985 that LeisureWheels entered the bike trade, taking over the shop from Moores Cycles. The shop remains in the same location, a listed building situated in the old town of Hemel Hempstead, constructed c.1730, and still offers a great range of bikes, accessories and clothing for every type of rider. LeisureWheels offer customers a range of purchase options, including part-exchanges on old bikes, cycle to work schemes and Ride it away retail finance. Whether you are a BMX'er or mountain-biker, recreational or weekend cyclist, first timer or experienced rider, LeisureWheels pride themselves on having the products and services you need, with knowledgeable and well-trained staff on hand. This month, the Shop of the Month is being awarded to Micks Cycles who celebrate 45 years in business this May! The retailer is staffed by three generations of the Hailstone family and was started in 1970 by Mick Hailstone. T he shop started life as Micks Mopeds, operating from a yard in Victoria Street before moving to a shop in Out Risbygate. Over the years, as the demand for mopeds fell, the business decided to concentrate on bicycles and it became Micks Cycles around 25 years ago, moving to its current premises in St Johns Street in 1993. Mick Hailstone sadly passed away in 1991, when his son Derek took over the shop and now Mick's granddaughter Chloe had followed him into the business too. Mick's wife Jessie is also very much involved with the business and can still be found behind the counter from time to time. Chloe said: "There has been so much interest in cycling recently - especially with the Women's Tour finishing in Bury St Edmunds last year and again this June. We had a stand on Angel Hill for the day and it was an absolutely fantastic atmosphere, its great to see the sport and especially women's cycling getting so much positive coverage. "We want to continue that feel-good feeling around cycling which is why we thought we should mark our anniversary in some way and we hope customers old and new will come and see us on the day." The business recently expanded to include a Bike fit studio and modern workshop facilities with qualified technicians specialising in repairs and servicing. Meanwhile the retail range is spread over two floors, 5 showrooms, and also has an extensive range of clothing, shoes and accessories alongside the bikes themselves. The shop offers customers 0% finance via Ride it away. "We like to think that we can cater for every type of cyclist from those who want a serious competition bike to cycles more suited to family leisure inclusive of childrens, and offer a range of leading bike brands which include Specialized, Marin, Merida, Frog, Claud Butler and Whyte." Mickey Cranks in opened in Oxfordshire in September 2013 and has quickly established itself as one of the leading Independent bike shops in the country. Since opening, the shop has made some notable strides forward in the industry and local community. It boasts the fastest growing cycling club in the country gaining over 770 members in just 1 year, including the UK's largest ladies race team -The Crankettes's. Most recently the West Oxfordshire Business Awards (WOBA) 2015 have revealed Mickey Cranks as a Finalist in the Best New Business Award. "Kirsty and I are delighted to be finalist's in this award category which is a reflection of the Mickey Cranks team's dedication and hard work over the past year," said Mick Murphy from Mickey Cranks. Mickey Cranks pride themselves on finding the perfect bike to meet customers' individual needs, and giving options to help customers buy their dream bike - including 0% finance. 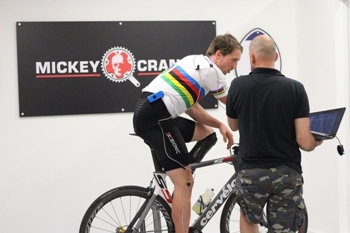 Their staff are trained bike fitters and have worked with World and National Champions. The shop even offers a professional Retül bike fitting service which will help optimize your power, comfort, efficiency and safety on the bike, Retül is the most advanced bicycle fitting system available on the planet. They are also particularly adept to the needs of female cyclists when selecting the most comfortable and best performing bikes and are recognised by the ACT and British Cycling as a Female Friendly Bike Shop. Their professionally equipped workshop is operated by Cytech certified technicians. Mickey Cranks work hard to give our customers honest advice on the best solutions to their bike repairs and service options. The Mickey Cranks team love every aspect of cycling, ride for fun most days and race at every opportunity. Established in 1975, CycleWorld started out as a small cycle department within the Sunderland branch of parent company Kawasaki World N.E. LTD. In July 2012 the shop branched out, opening a store in Chester Le Street, Durham. In the two and half years since opening, the shop has built up a good loyal customer base by offering a friendly, professional service at all times. The decision to open another store was not only to offer the same high quality sales and service to cyclist in Durham area but to also encourage people to take up cycling through their links with local clubs and the establishment of a cycling hub to share information. The shop is run by cyclists for cyclists whatever the type of rider. Offering a range of bikes to suit all customer needs with first class after sales service and top class workshop facilities for service and repair with Cytech qualified mechanics. All new bikes come with 6 months free service and a free basic workshop class to help keep your bike on the road. Cycleworld also gives customers a range of purchase options by offering cycle to work schemes as well as interest free finance via Ride it away. Since 1978 C & N Cycles in Redhill have been dedicated to fulfilling our customer's bike-related needs with great products and ever better service within Surrey and West Sussex. As cyclists themselves, C&N know that riders appreciate low prices without a compromise in quality. As such, their aim is to provide cyclists of all ages and abilities with quality bicycles, repairs, and accessories at competitive prices. As well as a great selection of products, C & N pride themselves on dedication to delivering great service offering quality personalised advice on products and proper bike fitting. The approachable friendly staff are always happy to help with any queries you may have and with fully qualified Cytech Three staff you are guaranteed expert advice and servicing. The shop boasts a professional bike fitting service, a range of bikes for hire and also offer Ride it away retail finance to help give customers the chance to buy the bike of their dreams by spreading the cost with as little as 0% interest. Plus, C & N have been featured in the Bike Biz Top 20 independent bike shops for the past three years!